NOTE that kireta2 (kiretai) is the Minoan orthography for Greek krithai (Latinized), which of course is barley. which when taken into account with total of 19 on the bottom half of the tablet yields a grand total of 130. 11 bushel-like units of barley, 42 units of emmer wheat, 30 units of emmer wheat mixed with 22 units of roasted einkorn, and 6 units of pure roasted einkorn + ro? with dry units of measurement (i.e. bushel-like units) + 4 units of mi? + ? + ? + along with 1 bushel-like unit of wheat 7 12 bushel-like units of te*123 (flax?) + 2 bushels of rumatase (spelt?) for a grand total of 130. As you can readily see, this decipherment makes perfect sense, and in any case, even if the text of original tablet did not read quite this way, it must have read very much like this. You will forgive my awful scribal hand. I cannot hope to be able to replicate the finer hand of the original scribe. This general plan of Haghia Triada with the locations of Linear A tablets incorporates the 14 tablets which I have managed to decipher more or less accurately to date. When I subjected the first alphabetical entries under A in Prof. John G. Younger’s Reverse Linear A Lexicon to rigorous analysis in order to determine whether or not any of the entries under A just might have been proto-Greek, or more likely than not, proto-Mycenaean. I was able to extrapolate tentative archaic Greek “definitions”, if you like, for no fewer than 10 of the 18 entries under A. That is quite a staggering return! However, in spite of these encouraging findings, we must exercise extreme caution in assigning proto-Greek significance to any number of Minoan words. Of course, the discovery right fro the outset of 10 words which might possibly be proto-Greek or proto-Mycenaean, is highly tempting. One could, if one were so inclined, that as a consequence of this discovery, the Minoan language must have been proto-Greek. But I would warn us away from such a rash assumption, for several cogent reasons, all of which will become clear as we run alphabetically through the Reverse Linear A Lexicon. One of the most obvious roadblocks to accepting, even on a tentative basis, a proto-Greek reading of words such as the 10 I have isolated under A above is the extreme paucity of consecutive, running text and, what is even worse, the even rarer instances of extant Linear A words providing sufficient context on the tablets for us to be able to extract any real meaning at all from the tablets. This is the brick wall we run up against again and again in any endeavour at deciphering any Minoan word, taken as a single entity. There is one tenet at least which bears out confirmation or abnegation, and it is this: if we continue to discover a considerable number of potential proto-Greek under subsequent initial syllabograms alphabetically from DA on through to ZU, then there might very well be a case for concluding that either (a) the Minoan language was entirely proto-Greek or (b) the Minoan language was pre-Greek and very probably non Indo-European, but which contained a great many proto-Greek words, for reasons which will become apparent as we proceed through our extrapolative analysis of Minoan words from DA to ZU. This is bound to be one exciting journey of discovery! Beginning today, and posting every two weeks or so, I shall be quoting alternately from the New Testament and from the Meditations of Marcus Aurelius in Greek. Wherever possible I shall also translate sentences and phrases in each citation. This is a very tricky manoeuvre, but at the same time it close to ideally serves me in writing in natural, not tabular, Mycenaean Greek. The next citation will be drawn from the New Testament in Greek in early January 2017. The Greek text is taken from Haines, C.R. ed. & trans. Marcus Aurelius. Cambridge, Mass. : Harvard University Press. 1953, with several revisions, the last of which was published in 2003. ISBN 0-674-99064-1. xxxi, 416 pp. Think of your many years of procrastination; how the gods have repeatedly granted you further periods of peace, of which you have taken no advantage. It is time now to realize the nature of the universe to which you belong, and of that controlling power whose offspring you are; and to understand that your time has a limit to it. Use it, then, to advance your enlightenment; or it will be gone, and never in yourf power again. Translation by Maxwell Staniforth = Marcus Aurelius Meditations. London: the Folio Society, 2002. Janke, Richard Vallance. The Decipherment of Supersyllabograms in Linear B, Archaeology and Science. Vol. 11 (2015), pp. 73-108. As soon as this ground-breaking article is published in early 2017, I shall submit it for review in every one of the international journals below. Since this article is not going to be published before mid-2017, and as yet has no pagination, I shall have to wait until then before I submit it for review to all of the periodicals below. Another failed attempt at “deciphering” Minoan Linear A & a warning to myself! And a warning to myself not to cross the line from reasonable speculation into untenable “theoretical” constructs. It is all too easy to do this! All too many past researchers and philologists attempting to decipher Minoan Linear A have made the assumption that they had first to determine what class of language it must or may have belonged to before they even began to attempt decipherment. This is, as we shall see, a false premise, a non starter, a dead end. It would seem, therefore, unlikely that the language of the Cretan scripts was any kind of Greek, and probable that it was related to the early language or languages of Western Anatolia – associated, that is, with the archaeological 'cultures’ of Alaja Hüyük I ('proto-hattic’) and of Hissarlik II and Yortan ('Luvian’)...”, and a little further, “Though many of the sign-groups are compounded from distinct elements, usually of two syllables each, there is little trace of an organized system of grammatical suffixes, as in Greek. At most, a few signs are notably frequent as terminals... (italics mine) and this in spite of its great antiquity, given that it preceded the earliest known written Greek, The Iliad and The Odyssey of Homer by at least 600 years! It was a perfectly reasonable and plausible assumption, in view of the then understandable utter lack of evidence to the contrary. So Evans was vacillating between the assumption that the Minoan language may have been related either to Luvian or Hittite (a brilliant assumption for his day and age) and that it was an ancestral form of proto-Greek. Both assumptions were wrong, but if only he had known that Linear B was alternatively the actual version of a very ancient East Greek dialect, namely, Mycenaean Greek, how different would the history of the decipherment of Linear B at least have been. To complicate matters, Michael Ventris himself, following in the footsteps of Evans, began by making the same assumption, only this time correlating (italics mine) Linear B with Etruscan, stubbornly sticking with this assumption for almost 2 years before Linear B literally threw in his face the ineluctable conclusion that the script was indicative of Mycenaean Greek (June 1952). My point is and here I must be emphatic. It is a total waste of time trying to pigeon-hole the lost Minoan language in any class of language, whether Indo-European or not. It will get us absolutely nowhere. So I have concluded (much to my own relief and with positive practical consequences) that it does not matter one jot what class of language Minoan belongs to, and that it serves us best simply to jump into the deep waters without further ado, and to attempt to decipher it on its own terms, i.e. internally. Notice that in 1. above I italicized the word correlating. This is no accident at all. It is only by the process of cross-correlation with a known language that we can even begin to decipher an unknown one. And of course, the known language with which the Minoan language must be cross-correlated is none other than Mycenaean in Linear B, if not for any reason other than that Linear B uses basically the same syllabary as its predecessor, with only a modicum of changes required by the latter to represent Mycenaean Greek, more or less accurately. This assumption or principle, if you like, is squarely based on the approach used by the renowned French philologist, Jean-François Champellion, who finally deciphered in 1822, 23 years after it was discovered in Egypt in 1799. How did he do it? He made the brilliant assumption that the stone, on which was inscribed the identical text in Demotic and ancient Greek, must have the exact same text in Egyptian hieroglyphics on it. And of course, he was right on the money. Here is were the principle of cross-correlation comes charging to the fore. If a given text in an unknown ancient text is on the same tablet as at least one other known language (and in this case two), a truly observant and meticulous philologist cannot but help to draw the ineluctable conclusion that the text of the unknown language must be identical to that of the known. Bingo! But I hear you protest, there are no media upon which the identical text is inscribed where Minoan Linear A and Mycenaean Linear B are concerned. The medium on which texts in both Minoan Linear A and Mycenaean Linear B are inscribed is the clay tablet. While it is indisputably true that there exist no tablets on which the identical text is inscribed in Minoan Linear A and Mycenaean Linear B, upon close examination, we discover to our amazement that there is at least one tablet in Minoan Linear A which is potentially very close to another in Mycenaean Linear B, and that tablet is none other than Linear A HT 31 from Haghia Triada, on which the text, at least to a highly observant philologist, would appear to be very close to a text on a particular Linear B tablet. And that tablet, we discover to our amazement, is none other than Pylos tablet TA Py 631-1952 (Ventris). Armed with this assumption, I forged right ahead and made a direct comparison between the two. And what did I discover? Both tablets mention (almost) the very same types of vessels in at least 4 instances. Armed with this information, I simply went ahead and found, this time not to my amazement or even surprise, that I was – at least   tentatively – correct. In the case of at least two words on both tablets, as it turned out, I was right on the money. These are (a) puko = tripod on HT 31 and tiripode = tripod on  Py TA 631-1952 (Ventris). This was the very first word I ever managed to decipher correctly in Minoan Linear A. My translation, as it turns out, is without a shadow of a doubt, correct. My excitement mounted. (b) The second is supa3ra or supaira on HT 31, which would appear to be almost if not the exact equivalent of dipa mewiyo = a small(er) cup on Py TA 631-1952 (Ventris), but without the handles on the latter. And as it turns out, I was again either close to the mark or right on it. Refer to our previous posts on the decipherment of these two words, and you can see for yourselves exactly how I drew these startling conclusions. Another Linear B tablet which is a goldmine of Mycenaean vocabulary from which certain Minoan words may be indirectly extrapolated is Pylos tablet TA Py Un 718 L.
By extrapolation of Minoan Linear A terms from their Mycenaean Linear B equivalents, I certainly do not mean that the former can be directly divined from the latter, since that is impossible, given that Mycenaean Greek is a known language whereas Minoan Linear A is unknown. What I mean is simply this: there is a good chance that a word which appears on a Minoan Linear A tablet which shares (almost) identical ideograms and relatively similar placement of (quasi-)identical text with its reasonably similar Mycenaean counterpart may share (approximately) the same meaning as its Mycenaean Greek counterpart. The clincher here is context. If the (quasi-)identical ideograms on both the Minoan Linear A and Mycenaean Linear B tablets appear strikingly alike, then we may very well have something substantial to go on. Pylos tablet TA Py Un 718 L is as close to an ideal candidate as there comes for such cross-correlation with tablets with similar text on one or more Minoan Linear A tablets. The presence of apparently (very) similar ideograms for vessels on both of the aforementioned tablets only serves to confirm, at least tentatively for most of the words on vessels I have attempted to decipher, and conclusively for the two words above, that I am (hopefully) well on my way to a clear start at deciphering at deciphering a small subset of Minoan Linear A. For lack of space, I cannot give details this post, which is already long enough, but once again, previous posts reveal in much more detail this principle on which my decipherments are founded, and the methodology behind it which lends further credence my translations. 4. Archaeological evidence lends yet further credence to my decipherments of 4 of the largest vessel types on HT 31, namely, karopa3 or karopai, nere, qapai & tetu. The problem here is, which one of the largest is the largest of them all, being approximately equivalent to the Greek pithos? I cannot tell from the tablet. However, since my initial stab at decipherment, I have tentatively concluded that Minoan Linear A words terminating in the ultimate U are masculine singular for the very largest in their class. Hence,  it would appear at least that tetu is the most likely candidate for the equivalent to the ancient Greek pithos. I cannot as yet determine with any degree of certainty that this is so, but it is at least a start. 5. (the most important principle of all). It is critical to understand that Minoan Linear A and Mycenaean Linear B both dealt with inventories and the process of inventorying livestock, crops, military matters and commodities such as vessels and pottery and textiles. Based on this assumption, it only makes sense that a particular inventory on a Mycenaean Linear B tablet which appears very close to a similar one on a Minoan Linear A tablet (Cf. Linear B Pylos tablet TA Py 641-1952 (Ventris) and its strikingly similar counterpart Linear A tablet Haghia Triada HT 31) is quite likely to bear some fruit in at least a partial decipherment of the latter. And this proves to be the case, as I have amply illustrated in previous posts. I am therefore committed to working on the operating assumption and principle that Minoan Linear A tablets (approximately) parallel to their Linear B counterparts (See principle 2. above). These five principles form the foundation of the first steps that appear to yield relatively convincing results in the decipherment of the 18 words in Minoan Linear A I have tackled so far. Relying on the application of these four principles, either singly or in combination, we can, I believe, make some real headway in the decipherment of roughly 5% to 10 % of the terms on the Linear A tablets. The greater the number of these principles entering into the equation for the decipherment of any Minoan word in particular, the greater are our chances of “getting it right”, so to speak. This is a very good start. Warning! Caveat: yet even the application of these 5 principles, singly or in tandem (and the more we can apply, the better) cannot guarantee that at least some of our “translations” are incorrect or even way off the mark, because some of them are bound to be just that. I have already discovered that my initial translation of kaudeta on Linear A tablets HT 13 and HT 31 is probably off-base. Time to return to the drawing board. On the other hand, at least to date, it is virtually impossible to decipher any Linear A words on any tablet to which any or all of the aforementioned principles cannot be safely applied. This leaves hundreds of Minoan terms virtually beyond our reach. In other words, tablets on which Minoan vocabulary appears, but without any reference or link to the 4 principles mentioned above remain a sealed mystery. But that does not trouble me in the least. January 2016 is “chariot” month. So let’s take you for a ride! Here is the first tablet illustrating a chariot with 2 stallions being driven by a fellow whose name translates something like “longshoreman”, which makes sense if the fellow is a post messenger who frequently drives to and from Knossos and its harbour, Amnisos. Rita Roberts and I shall be posting at least a dozen chariot-related tablets in January. 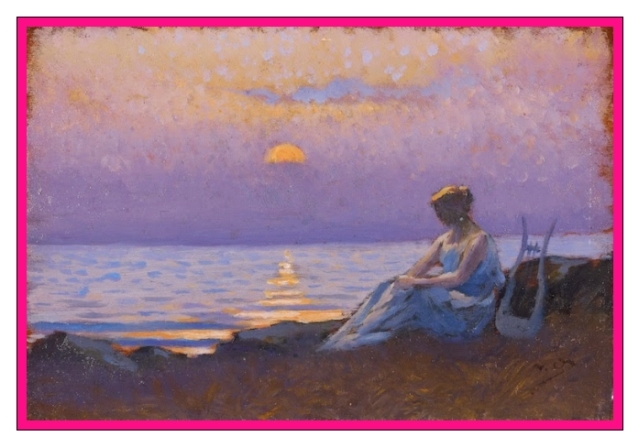 This article with my translation of Sappho’s Ode, “The Moon has set, and the Pleiades...” into two archaic Greek dialects (Linear B & Linear C), as well as into English and French, is the first of its kind ever to appear on the Internet. If you would like to keep up with my ongoing research on academia.edu, you should probably sign yourself up with them, and follow me. Additionally, you can follow anyone else you like, especially those researchers, scholars and authors who are of particular interest to you (not me). And of course, once you have signed up with academia.edu, which is free, you can upload your own research papers, documents, articles, book reviews etc. to your heart’s content. Oh and by the way, we have a surprise coming up for you all, a research paper by none other than my co-administrator, Rita Roberts of Crete.